"This excellent production shows the value of outdoor education and should stimulate viewers interested in starting a similar school or community project. Garden tacos (kale leaves filled with carrots, cucumbers, and tomatoes), anyone?" "This film is essential to re-imagining school curriculum and expanding our idea of how and what students can learn...Cultivating Kids is a conversation starter for school staff and anyone interested in relevant schooling and using gardens as a community-building tool." "With experiential learning gaining increasing traction nationwide, this short film offers a unique look at a successful school garden program. Recommended." 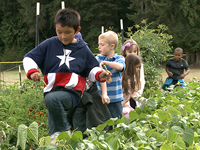 "Cultivating Kids captures both the spirit and functionality of school garden programs...This film clearly demonstrates the academic, social, and health benefits of school gardens and could be well used in garden or place-based education courses to initiate and support conversations among pre-service as well as experienced teachers about the value of this outdoor educational resource." "Cultivating Kids so beautifully captures the excitement and joy that farm to school brings to kids, educators, and community members. Show this film to anyone you want to convert into a lifetime farm to school supporter!" "From hands-on science to healthy eating and food justice, Cultivating Kids shows the potential to employ school gardens as an integrated context for meeting today's educational goals. Through diverse footage and interviews, we see the many ways that a garden cultivates not only plants, but also wonder, joy, and transformative education in a space where teachers, administrators, students and community members can connect with the idea that 'in this one seed is an entire life.'" "Cultivating Kids is the ideal film to show all stakeholders that are either considering a school garden or have an existing garden that is needing an infusion of excitement...Parents, teachers, school administrators, and community members will all find a special connection in this film that will motivate them to support a garden program for their school. The students are the real stars. A must see!" "What a great film! Cultivating Kids can serve as an inspiration to schools who are less familiar with school gardens and to the communities who can benefit from them. The South Whidbey School District has created a wonderful program that demonstrates the endless possibilities of school gardens to serve as powerful education tools and promote healthy lifestyle habits among students." "A lively exploration of how valuable outdoor garden education is for children and youth to connect with life cycles and learning. It is also a stirring testament to the powerful yields youth can learn through hands-on learning...The South Whidbey school garden is powerfully presented as an inspiring model for new and established school gardens alike." "We are so excited by Cultivating Kids...We hope this movie inspires and refreshes all of you on your Farm to School journey." "Cultivating Kids provides an inspiring breath of fresh air. It shows us how to get school children of different ages deeply engaged in hands on, age-appropriate learning about nature that is directly connected to their own lives and nutritional health, and the wellbeing of the world, while they are also learning the kinds of science and math skills they need to know to meet today's academic standards." "Well done...I hope the film will inspire more schools to mimic their model. How the School Farm and Middle School Garden is interwoven into the school day is nutrition education at its finest." "Cultivating Kids highlights the best of partnerships with communities and schools...Preservice teachers would love to see how 'tasty' school can be - watching children work in the garden, hearing teachers discuss the merits of experiential education and learning about how to involve so many community members with education. The planful intentionality, academic rigor and participant investment in this project shows the possibilities of what school can be." "An innovative education idea beautifully presented. Educators will benefit from seeing this film and incorporating its ideas into their own practice; older elementary and middle school students may enjoy it as well."